With the market flooded with skin care products, you may find it overwhelming to pick the right one. If you’re looking for skin-friendly products that are vegan and cruelty-free, making the right choice may become even tougher. Perhaps you want to invest in a skincare product formulated with a natural cocktail of cruelty-free ingredients. 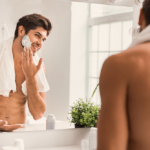 Now you can confidently nourish and hydrate your skin with vegan skincare for men using beauty products that have never been tested on animals. There is more to veganism than the plant-based diet. You are already starting to pay attention to what you put in your body. 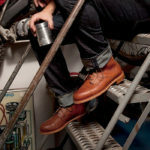 Now you are becoming increasingly watchful of what you put on your body. Of course, you ought to find products that do not use ingredients sourced from animals because you won’t kill an animal for food. So, can you use products using ingredients for which an animal has been butchered? No, not even in dreams! Vegans can’t kill an animal for food nor can you use any product tested on animals for any other reason. But that does not mean you have to sacrifice beautiful skin for a vegan lifestyle. Being the largest organ in the body, human skin absorbs almost 60 percent of the products applied onto it. Can you take the risk of using such processed skincare products that are full of chemicals, preservatives, and toxins? Vegan skin care is packed with vitamins and minerals. These products pack a powerful antioxidant punch and are ultimate in skincare, repairing and hydrating the skin. Plant-based skincare products are free from animal-derived ingredients and sourced from plants and minerals. Vegan skincare uses safe man-made ingredients, so you do not have to bear the burden of using animal products. Here are a few top vegan skincare for men products that are friendly to your skin and cruelty- free as well. The ultra-soothing moisturizer is sourced from natural plant-based ingredients and free from harsh preservatives, so you can have peace of mind that you are using a cruelty-free personal care product. Ultimate in skin care, the best organic face moisturizer eliminates harsh preservatives and animal products to provide that skin soothing effect from cucumber and rosemary extracts. Non-greasy, the non-comedogenic moisturizer prevents moisture loss to promote a healthy glowing skin, giving your skin a subtle glow. Vacuum packing in an airless pump prevents microbial contamination. If you are looking for a gluten-free, cruelty-free beauty product, the lavender facial lotion is an unbleached, unprocessed, and non-toxic alternative to the “white stuff” that is packed with essential plant oils, nutrients, and lavender. The addition of microalgae makes it an excellent sunblock that protects your skin from UVA and UVB rays, without actually blocking natural vitamin D from the sun. A little goes a long way in leaving your skin silky smooth, without any fillers or secret ingredients, thanks to its Aloe Vera-based formulation. Buy Skin Soft Organic Moisturizer from OM BOTANICAL here. A boon for sensitive skin, the Bulldog moisturizer is packed with 8 essential oils. The chemical-free lotion is formulated with plant extracts, including antioxidant-rich green tea, skin-friendly vitamin E, and green algae. The anti-inflammatory moisturizer is a loyal friend to your skin that hydrates sensitive skin, lending it a natural glow. A must-have lotion for your skin cleansing routine, the all-natural formulation does not contain parabens, synthetic colors or fragrances, or sodium Lauretha sulfate. The vegan skincare for men moisturizer smells great from plant-based ingredients, heals scars and razor burns, and improves skin elasticity. 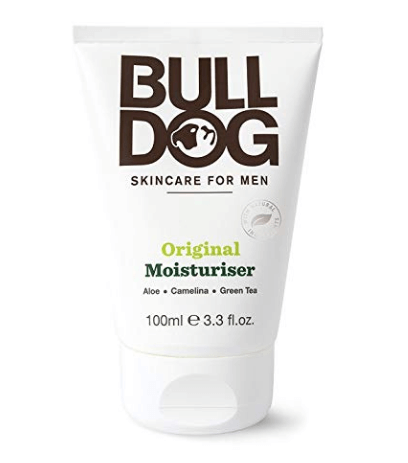 Buy Bulldog Original Moisturizer here. Here is one aluminum-free odor protection deodorant that uses charcoal and does not stain light-colored clothes. 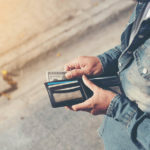 The additional benefit of using the magnesium cologne is that it eliminates odor and wetness, so you do not smell like a high school teenager. Unlike other natural dispensers, the vegan Schmidt’s deodorant does not leave you feeling sticky; rather, you smell good all day long. The product is worth the money and gives you satisfaction that you are putting all-natural ingredients on your skin, without the risk of using commercial, chemical-laden dispensers that can upset sensitive skin! 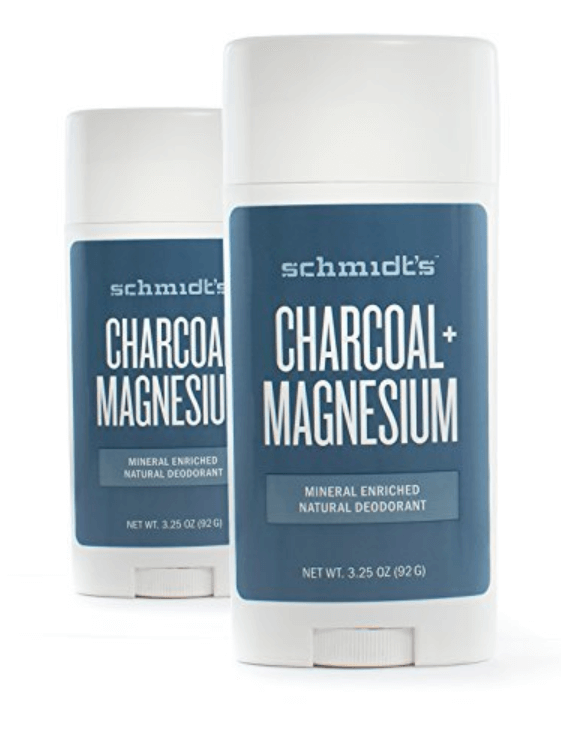 Buy Schmidt’s Natural Charcoal and Magnesium Deodorant here. Aesop’s aromatic body cleansing gel is the ultimate in vegan skincare for men with its aromatic Geranium leaf extract that reinvigorates senses. Its mild, low-foaming formula with a sensual fragrance helps cleanse and deodorize without dehydrating the skin. Aesop’s geranium leaf body cleanser seconds as a hand wash, leaving the skin nourished and refreshed. It is an ideal vegan cleansing solution for all skin types that cleans well enough, leaving you feeling refreshingly fresh with its uplifting aromatic scent. The product does not have any irritants that could upset sensitive skin. 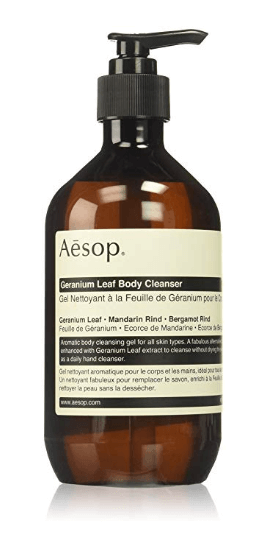 Buy Aesop’s Geranium Body Cleanser here. An all-day working deodorant that comes in three flavors, this is a refreshingly aromatic cruelty-free product. Sourced from premium plant-based ingredients, the deodorant is certified vegan and free from chemicals and parabens. The “made in the US” tag is surely a confidence booster while the mineral-derived ingredients neutralize strong odors and keep you smelling and feeling fresh all day long. 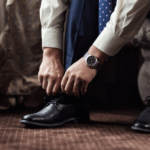 The cologne uses natural plant-based powders and no synthetic chemicals to absorb wetness. Its uniquely aromatic scents of Cedarwood & Juniper, Ylang-Ylang & Calendula, and Lavender & Sage smell sweet and wonderful without having any overpowering scent. The deodorant is the best for hairy armpits and sensitive skin. Its non-greasy, non-sticky formula makes the Schmidt deo a perfect fit for your self-care routine. The natural deodorant is easily absorbed in the body, and a little is enough to keep you feeling fresh for the day, with no burning, redness, or itching. 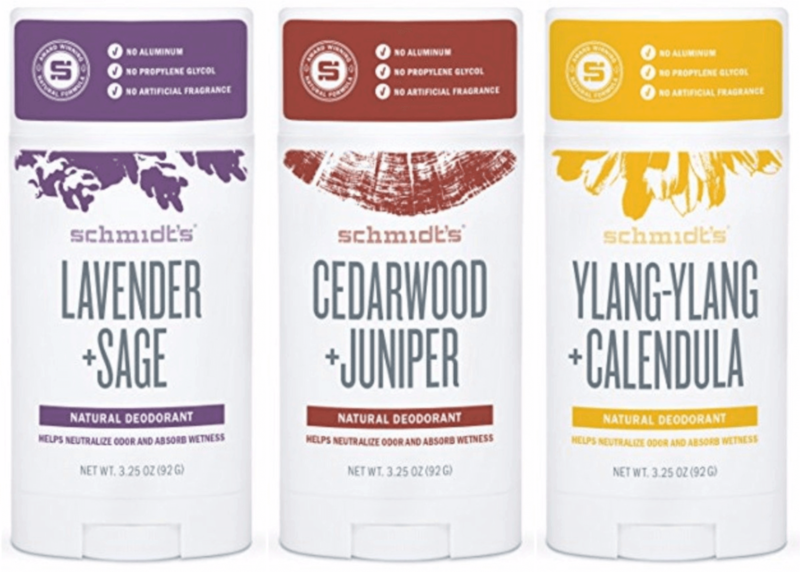 Buy Schmidt’s Deodorant Variety Pack here. If all-natural ingredients interest you, then the organic face wash is a must-have in your vegan skincare for men routine. A cruelty-free cream cleanser with exfoliating vitamin C gives you a younger looking skin in only 45 seconds. Sourced from natural extracts of green papaya, aloe, and pineapple, the all-in-one face wash is the best thing to include in your skincare regimen, thanks to its non-irritating, non-abrasive face exfoliation formulation that gives you smoother, softer skin within seconds. Give your skin an aromatic dose of antioxidant-rich Vitamin C from acerola cherries to help it fight free radicals and keep it feeling refreshingly fresh all day long. The unbleached, unprocessed, chemical-free formulation provides grit-free exfoliation and toning that provides a thorough cleansing experience without irritating the skin or clogging your pores. Thyme kills acne bacteria and is your ultimate defense against pimples and tissue swelling. It is formulated with bio-active herbs that promote speedy cell regeneration and provide a fragrant spa-like experience. Buy One Step Organic Face Wash here. If you seek a loyal companion for your skin, the Bulldog natural moisturizer is packed with 5 essential oils to hydrate your skin, reduce the appearance of wrinkles, and leave it feeling nourished. The non-greasy formulation is ideal for all skin types and does not leave your face feeling sticky. Its unique ingredients pack a powerful skin-friendly punch that gives you a younger looking skin within a few weeks of use. Along with millet seed extract, the lotion contains oak apple tannins to create a powerful antioxidant combination ideal for skin lubrication and natural wound healing. The vegan skincare for men moisturizer is free from chemicals and parabens and completely free from animal sources. 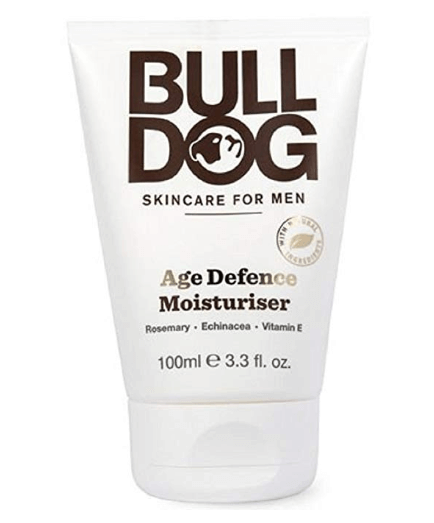 Buy Bulldog Natural Skincare Age Defense Moisturizer here. 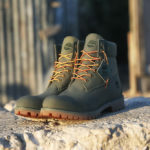 Previous Previous post: Christmas Vegan Men Shoes Giveaway! 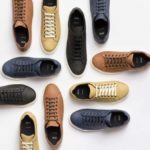 Next Next post: Vegan Shoes from Hugo Boss are Now Out!